Xiaomi says there is no Mi 5s, but there might be a Mi Note S? For weeks now, we have been passing along leaked images and specs about a new high-end handset from Xiaomi called the Mi 5s. We even showed you an alleged invitation with a large "S" revealing a September 27th date for the unveiling of the phone. But as it turns out, there might not be a Xiaomi Mi 5s after all. 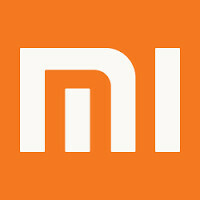 In response to an inquiry on a Chinese social media board, Xiaomi allegedly responded by saying that there is no Mi 5s. 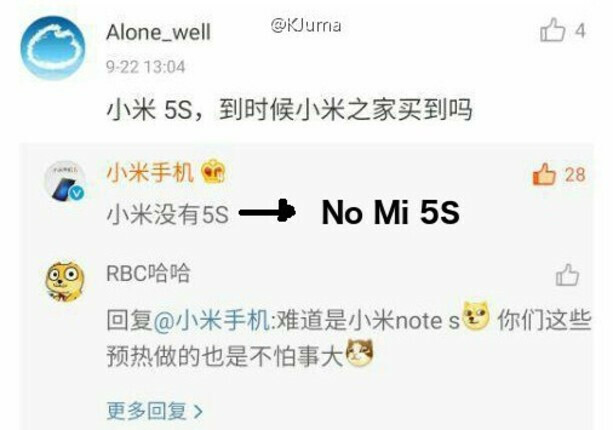 It is possible that instead of the Mi 5s, we will see a Mi Note S. But before we start aligning ourselves with this rumor, another Chinese social media board repeated a previously leaked rumor about the pricing for the Mi 5s. According to this speculative post, a version of the phone with 6GB of RAM and 64GB of native storage will be priced at the equivalent of $299 USD. A variant of the Mi 5s with 6GB of RAM and 128GB of native storage, will be priced at $345 USD. Lastly, a model of this device with 6GB of RAM and 256GB of internal memory will be priced at the equivalent of $405 USD. Thankfully, in only five days we will know exactly what Xiaomi has up its sleeve. Regardless of what the name of the handset is, we expect that it will be powered by the Snapdragon 821 chipset with a quad-core CPU and the Adreno 530 GPU. There will be Force Touch support for the screen, which carries a 1080 x 1920 resolution. On back is a 16MP camera offering a 4-axis OIS, laser focusing, and an aperture of f/1.8. A 13MP front-facing camera snaps selfies and handles video chats. The 3490mAh battery has its power quickly replenished thanks to Quick Charge 3.0. So will it be the Xiaomi Mi 5s, the Xiaomi Mi Note S, or will we end up with our "S" kicked and find out that no such model exists at all? Stay tuned. Like other rumors,the pricing wil also be incorrect. But it's xiaomi so even if the rumored price is wrong the price will still be very right. I really would like to try this shaiomi or Xiaomi but i am hesitant because of the software. I dont know what their skin is like..
Xiaomi's MIUI is loaded with features while remaining easy to use. I really like it, your mileage may vary though. I'd say give it a shot. definitely give it a try and install dev rom. dev rom gets updated every Friday and receives monthly android security patches before any other manufacturer. Loved my Mi Note Pro but will be super stoked regardless of if the new phone is a Mi Note Pro S or a Mi5s. Looking to upgrade ASAP. And to answer killer7D, yes, MIUI is pretty awesome and jam packed with features. It can be a littler quirky at times but the occasional hiccup is worth it for all the other brilliance.